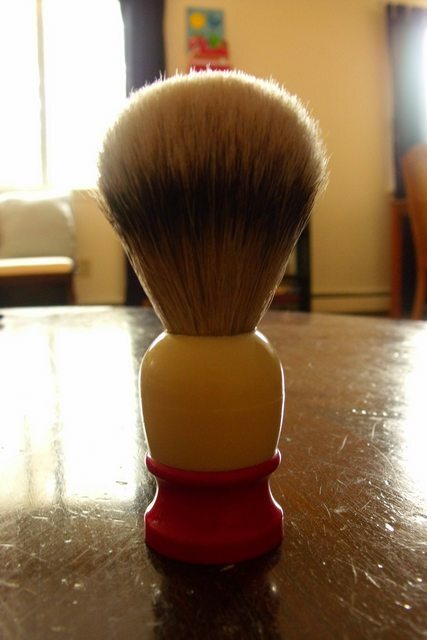 After seeing the post on brush restoration using steam, I thought I would add my method of brush restoration, including the steps beyond knot removal. This is a bit image intensive and long, so I've broken it up into three parts. 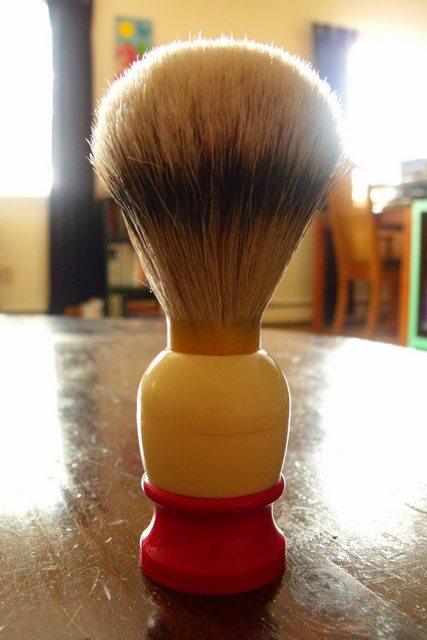 The brush I'll be working with is an Ever-Ready C40. The first thing to do is to cut off as much of the original hair as possible. I like to use a Cutco steak knife. After the hair is removed as best as you can, use painters tape to cover the top of the handle. This will prevent damage from the accidental drill slip. Then use a small drill bit to get a few pilot holes in the epoxy. I tend to do three angling into the center of the knot. Progressively move to larger bits until you either (a) run out of large bits or (b) feel you can't safely drill out any more without damaging the handle. I'll usually go to my 1/2 inch bit and call it quits. I then like to whip out my Dremel and the grinding bit to grind the epoxy back to the original hole's dimensions. 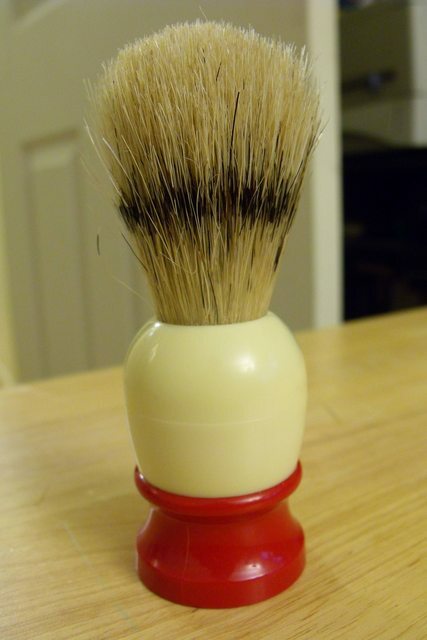 Next, you can smooth out the edges with a high grit (800 or higher). If the hole is a little too small for your desired knot, you can always enlarge the opening, as I did with this handle. Order your knot from your preferred vendor, I personally go with either Whipped Dog knots or TGN knots. Larry (Whipped Dog) has less expensive knots than TGN, but his selection is also more limited: Either black badger or Silvertip in an assortment of sizes. TGN has a larger selection of types of knots (Super Silvertip, Silvertip, Finest Badger, even some boar) and a wider selection of sizes. However, TGN prices are significantly higher than Larry's. In my opinion, Larry's silvertip is softer than the TGN Super Silvertip (their top of the line). In this case, I went with TGN's 22mm Super Silvertip. Part 2: Setting the knot. Once you receive your knot, you can try test fitting it. As you can see below, the 22mm knot didn't fit - I needed to do some additional work. My method for enlarging the opening is to use my Dremel sanding drum on the lowest speed to slowly enlarge the hole. I like to keep the Dremel stationary with my weak (left) hand, and move only the handle with my strong (right) hand. Using short, yet smooth circular motions, gently sand the lip of the opening, rotating a third turn every few sanding cycles. Test fit the knot frequently to make sure you don't over-embiggen the hole. The epoxy ring of the knot, and the first few mm should fit easily into the hole when it has been sized properly. I like to make the hole large enough to fit the lower half of the knot in the handle. This ensures that I can set it to pretty much any loft that looks good with the handle. Knot fits a little better, but needs a bit more room. Once you're confident that the knot fits properly, you're ready to assemble your final materials. Fishing weight (optional, adds more heft to the handle). 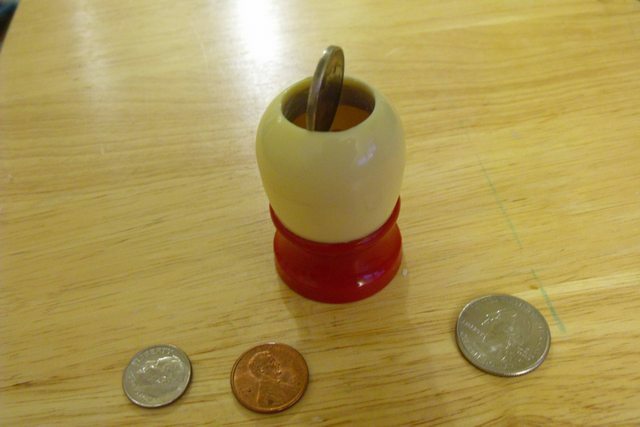 The one pictured is a 1/4 oz weight. To get a rough approximation of how much epoxy to use, test fit your knot to the loft you desire. Use your thumb to grip the knot as close to the handle as possible, then remove the knot, keeping your thumb in place. Use the Q-tip or ruler to measure the distance from the base of the knot to your thumb. Now measure the depth of the handle and subtract the knot measurement. The resulting depth is approximately the depth of epoxy you should use. Keep in mind that if you are putting objects in the handle (e.g. 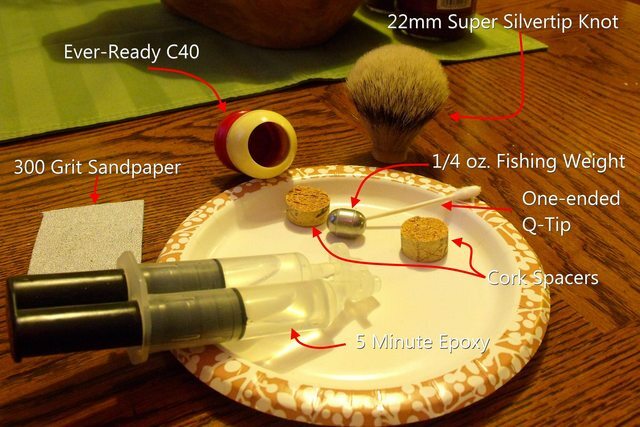 cork, fishing weight) you won't need as much epoxy. 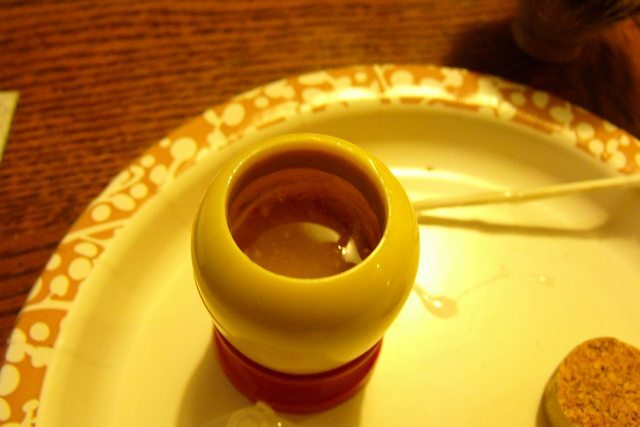 However, excess epoxy is somewhat easy to deal with (especially if you have the clear drying variety). I find it helpful to mark this depth on the q-tip so that I can easily determine if I need additional epoxy in the later steps. Roughly sand the bottom of the knot with the sandpaper, and wipe off any lingering particles. Rinse out the handle and dry well to make sure it is clear of dust/plastic/old epoxy dust. With the approximate depth of epoxy figured out, start filling the handle with the two part epoxy. Mix well with the qtip and if desired insert the fishing weight/cork. 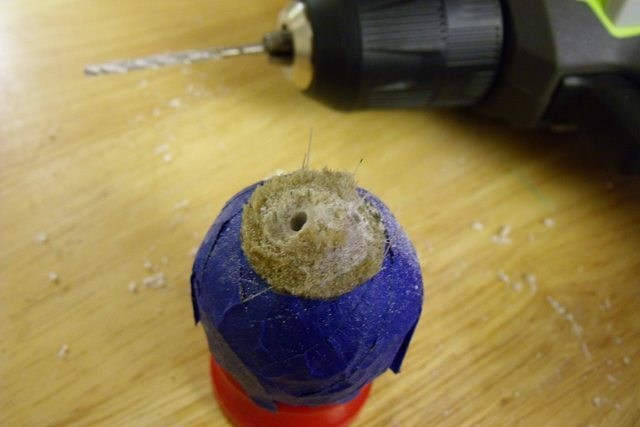 Test the depth with the marked q-tip and once you are satisfied that there is enough epoxy, insert the knot. Make sure the knot comes into contact with the epoxy, and use the wet paper towel to wipe any excess epoxy that may be squeezed out at the opening. If any epoxy starts to get wicked up the hair, use the damp paper towel to wipe it down. Note that there is a chemical reaction that will make the handle hot during the epoxy setting process - this is normal. 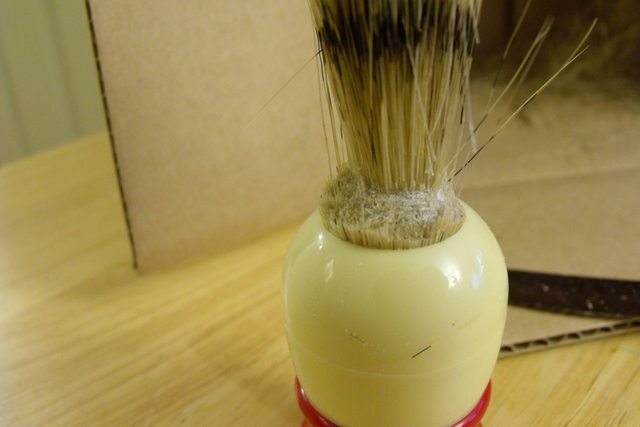 Let the newly restored brush sit for at least 24 hours (or whatever the epoxy instructions say) to let it fully cure. 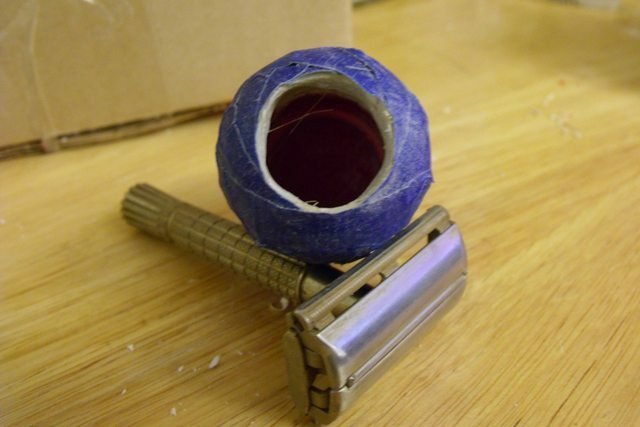 You can clean/polish the handle before or after you set the new knot. This handle was in good enough shape that I left it as is. On other handles that needed a bit more TLC, I tend to address that issue before I remove the old knot (the old hair is an excellent "handle"). My handle cleaning regimen usually entails cleaning/rough polishing with Flitz, the following up with a final polish with Turtle Wax Hard Shell. If you so desire, you can re-wrap the handle with painter's tape prior to epoxying. This will make spills immensely easier to deal with. Your first restore will be a learning experience. 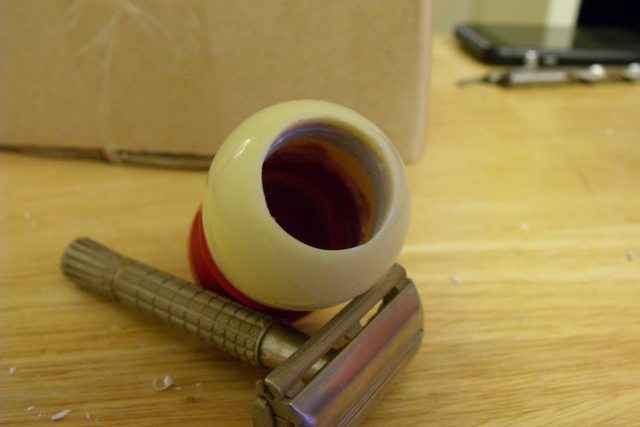 Don't pick your favorite Bakelite, über-awesome handle as the first you restore. Similarly, don't go with $30 Super Silvertip for your first attempt. My first attempt resulted in a knot set way to high and as a result is too floppy to use. Great tutorial Pez. I will just need to be extra careful not to over-embiggen the opening. I'd hate to ruin a nice handle, it would be a tapestry of justice. (04-20-2012, 07:58 AM)daccpa Wrote: Great tutorial Pez. I will just need to be extra careful not to over-embiggen the opening. I'd hate to ruin a nice handle, it would be a tapestry of justice. Yes, yes it would be! Great instructions and a nice looking brush in the end. Well done. (04-20-2012, 08:56 AM)Johnny Wrote: Great instructions and a nice looking brush in the end. Well done. An excellent step by step tutorial. Thank you. Thank you so much for this great tutorial and the explanations and pics.I sure it would help people when they do their restorations projects. Excellent work and very detailed instructions. 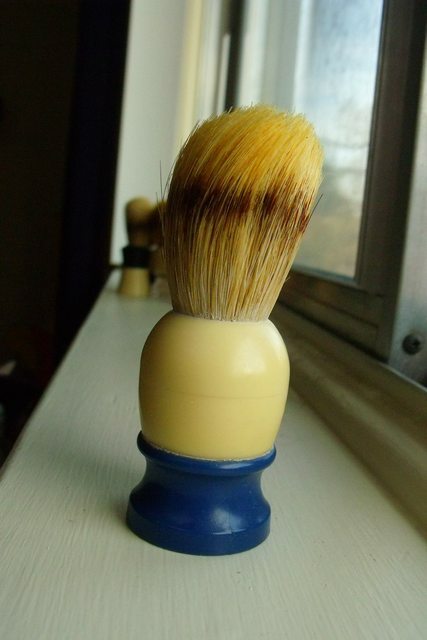 Of course the brush looks wonderful as well! Hello, sir. That is a great tutorial! Incredible detail! 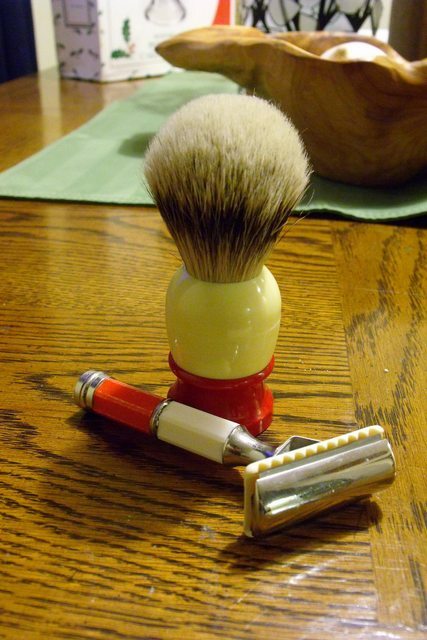 Great looking brush and matching razor handle! (04-22-2012, 10:38 PM)andrewjs18 Wrote: very nice tutorial!!! Thanks! I really love the shape of the Ever-Ready C40 (and its derivatives). Very nicely done! This is more or less how I've done all my restorations as well. A couple of tips from my experience, the old hair seems to cut a little better and fly around less when wet. Not dripping wet, but dunked in water and squeezed out wet. I also use a pair of heavy leather gloves while cutting and drilling. I haven't had any accidents yet, but I know the gloves have kept all my blood on the inside a couple of times. (04-23-2012, 09:38 PM)MrGuy Wrote: the old hair seems to cut a little better and fly around less when wet. I never thought about that. This tip is right up there with the, "tape the handle prior to epoxying for easy cleanup" tip. Thank you for the tutorial. I have 3 handles I already trimmed the hair back on, so the steam method wasn't an option. I'll probably end up taking a chance and starting with a brush I would hate to mess up. I read dozens of threads on this and always had doubts. This is the clearest tutorial on the subject, we'll done sir! Great tutorial, it is very helpful. Almost something a less then handy person could do. I used your knot removal method today on an Ever Ready 100-T. When my knot gets here I will be studying this even more. This is my first restore and your guide is very helpful. Thank you for posting this.